I’ve had a breather and it’s time for a little reflection on the A-Z challenge – the 26 posts on castles I wrote for April’s blogging challenge. This year was my second attempt – I participated last year on the theme of inspiration and with this in mind, I chose what I thought was a theme that not only I love, but would provide plenty of letters. I was determined to be a little more organised and write as many in advance. I did this with about half of my post, mainly due to being on holiday for the week. Researching is something I enjoy and part of my job history. It would be easy for me to write much longer posts, ramble away, so I had to find interesting facts, things that intrigued me and made each location unique. To my delight, many of my choices tied in well together. Keeping it fun was my motto. Some letters came easy, others harder. Ironically I rattled off the end of the alphabet because there weren’t many choices for castles. However, some letters I was spoilt for choice and I dithered about which to do. It would be a shame not to miss out on those, so I’m going to add some more castle posts in the coming weeks and months, just not every day! What I know from being an avid blog reader is that to make a post appealing it needs to contain the right balance of things: originality, ease of language and the odd picture or two. I hope I got that balance right. The little pieces of fiction at the end of some posts were my goals. I’m always on the look out for inspiration and way to engage. I treat my blog as a playground more than a journal. I don’t write about my day to day life, not even the big events. 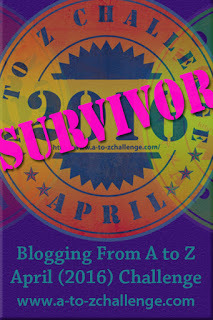 The A-Z challenge is one way of maintaining momentum to blogging and providing incentive to write. What I love most of all is meeting new bloggers, reading other peoples’ posts and shrinking the world down into my computer. For a month, I don’t live on a huge planet, but one street with lots of interesting people with much to share. I’m amazed when I discover how far and wide my blog is read. So thank you to my visitors. The quality of posts I saw is incredible and inspiring, as was the variety, not only of topics but also style. I just wish there were more hours in the day to spend reading blogs. I will endeavour to write a few more for you. Thank you. This is really what the challenge feels like. Or what blogging at large feels like. I think this is why I’m doing it, and you expressed it so well. I do believe blogging is a community activity. I’ve some ideas for a few more posts. I really enjoyed your theme. I looked forward to your A to Z posts! I am excited to see what your plans are for next year! I’m going to plan way ahead for next year! I thoroughly enjoyed you trip around the castles. Like you I keep my day to day happenings completely separate from my blogging. For me, my blog is a special place away from real life, a refuge. Looking forward to seeing what you do next year. I don’t think anyone would be interested in my day to day happenings, they’re very mundane. Writing on the other hand is much more interesting. Wow, thank you. I shall check it out. You’re very kind. I’m glad you enjoyed the castles. I love your theme, what fab idea! It’s ideal if researching history is something you enjoy 🙂 I agree about the quality of the blogs joining in, it’s phenomenal! I love researching history and this is an ideal subject to cover off so much history. The quality is excellent and so many people put such hard work into them.